It is interesting to notice that at least three among this season’s Oscar contenders, Birdman, Foxcatcher and Whiplash, deal with the problem of self-creation and the resulting psychological duplicity. Coincidence? Given the current socio-cultural context, it would be naive to think so. In the age of social media and the ensuing epidemic of self-obsession, it is only natural for the art of cinema to demonstrate a renewed interest in the theatrical nature of human interactions with the world. Alejandro González Iñárritú’s drama Birdman or (The Unexpected Virtue of Ignorance) is a fascinating study of the boundaries between what we call “reality” and the manipulated image produced as a result of a performance, be it an artistic representation of a character on stage or screen, or a psychological mind game played on a frequently unsuspecting audience consisting of family members, friends or complete strangers. 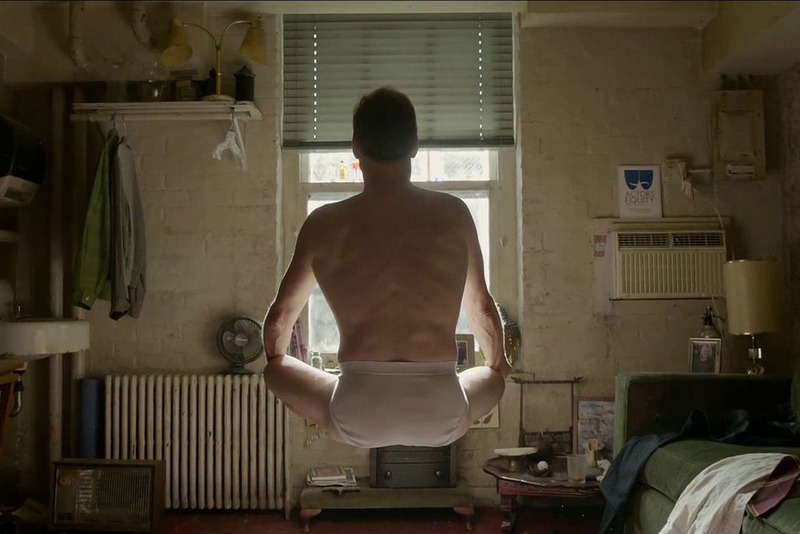 Birdman tells the story of Riggan Thomson, a middle-aged star of a hit Hollywood franchise who struggles to regain credibility and self-respect by taking on a challenge of directing and staring in his own stage adaptation of Raymond Carver’s prose. However, haunted by the memory of lost fame and admiration materialised in his screen alter-ego, the Birdman, Riggan quickly falls into a schizophrenic roller coaster of self-importance and self-doubt. His condition is only aggravated by the appearance of the brilliant method actor Mike Shiner, whose nonchalant self-confidence stemming from a firm trust in his own craft makes Riggan question the sense of the new endeavour. Iñárritú’s film deals with the universal issues of the unbridled human ego, the grand dream of immortality and the fleeting nature of fame in a truly striking manner. The script is rich and layered, witty and abundant in contemporary references, providing an insightful commentary to the bizarre world where one’s worth is measured in the number of followers on Twitter. The story is populated with a whole array of individualities, each of them exhibiting some degree of attention deficit disorder. Regardless of their background and personal circumstances, they are all touchingly human in their desperate need for recognition. The impressive cast, led by the extraordinary Michael Keaton whose own superhero past in Tim Burton’s productions adds a special flavour to Riggan’s role, do a superb team job depicting constant tensions within the stage actors’ milieu. Beside the fascinating Edward Norton as Riggan’s stage rival Mike, a special mention must go to Emma Stone who is no less than remarkable in the part of Sam, Riggan’s highly-strung, troubled daughter. “You’re kind of a great mess. Like a candle burning on both ends, but it’s beautiful” – says Mike to his young muse in a line which makes for a perfect description of Stone’s masterful performance. 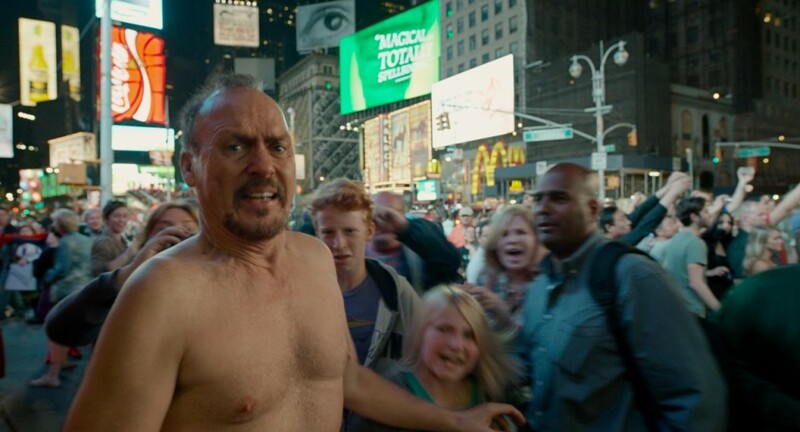 Birdman isn’t, however, as it may seem at a first glance, just a satirical take on the show-business industry. As a matter of fact, more than about theatre circles Iñárritú comments on the society as a whole – the action-craving, unreflective masses who “see the world through their cellphones’ screens” and whose “only ambition is to go viral”. The director’s astute vision is rendered in gripping cinematography by Emmanuel Lubezki, last year’s Academy Award winner for Gravity. With extensive usage of close-ups and prolonged shots, this talented artist has managed to create a unique, claustrophobic microcosmos of a grotesque quality. 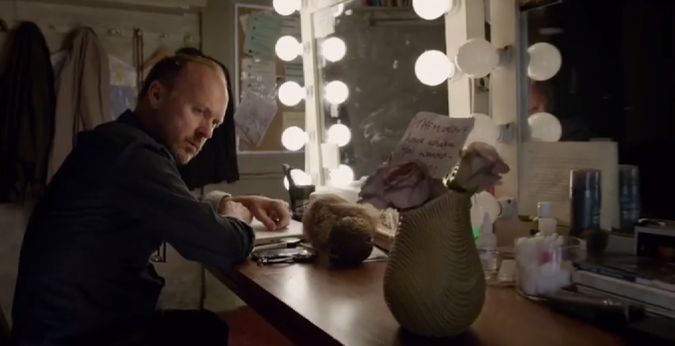 As the paranoid mood arising from Riggan’s emotional tribulations deepens, the confined theatre interiors are replaced with bird’s (or, more aptly, Birdman’s) eye view of urban landscape, completely blurring the already unclear boundaries between facts and imagination, the real and the represented. This seamless transition, accompanied by Antonio Sanchez’s edgy, drum-led musical score lending the film its irregular, neurotic heartbeat, is truly hypnotising. The subject of social persona and its complex implications has proven attractive to artists of various disciplines and genres throughout centuries of human creativity, resulting in numerous works of great cultural significance. Iñárritú’s original meta-theatrical perspective not only sets his film among the most inspiring of its kind, but also marks a new reference point with regard to style of cinematic expression. 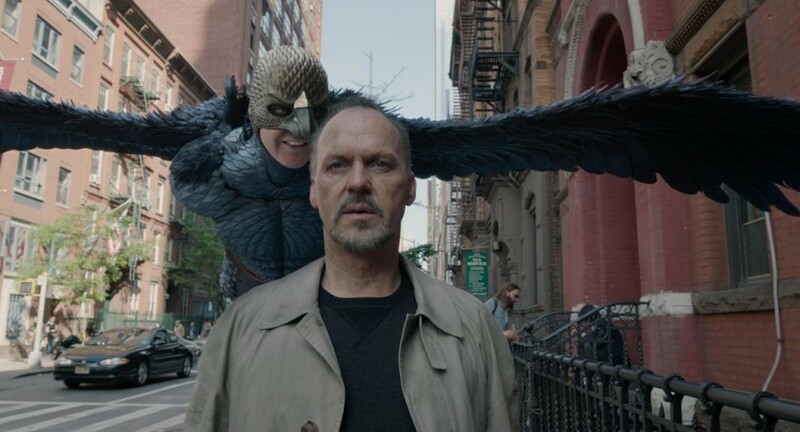 All at once utterly captivating, thought stimulating and intelligently amusing, Birdman has all the necessary potential to become a true classic, cherished and admired by generations to come. Its special value appears even more evident by comparison with this year’s unprecedented selection of titles dealing with similar issues. While Foxcatcher by Bennett Miller and Whiplash by Damien Chazelle are both solid and engaging pieces of filmmaking, revolving around the power of influence exerted by self-delusional personalities with a superiority complex, in terms of artistic vision they don’t even come close to Iñárritú’s latest achievement. 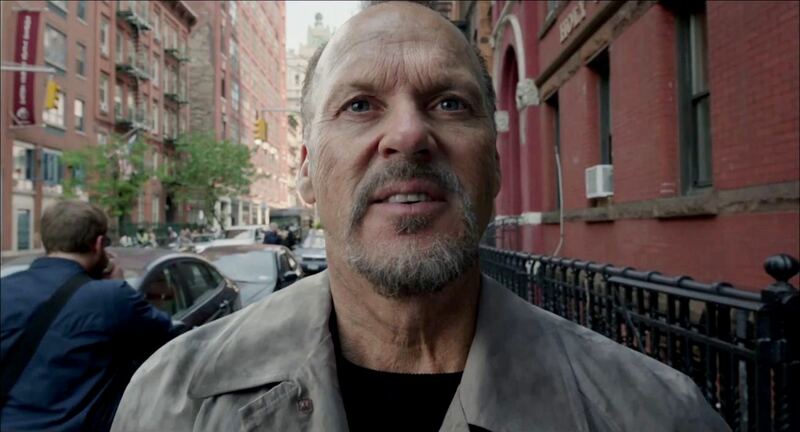 For Birdman offers much more than a heart-wrenching story convincingly executed by an adept cast. Providing the audience with a magic mirror whose cracked surface reflects an unadulterated and thus painfully real image of their own selves, it is a work of tremendous aesthetic and intellectual appeal that leaves an indelible impression. © Anna Bajor-Ciciliati, 2015. Unauthorised use and/or duplication of this material without express and written permission from this blog’s author and owner is strictly prohibited. Excerpts and links may be used, provided that full and clear credit is given to Anna Bajor-Ciciliati with appropriate and specific direction to the original content.